Filed to: BOX BOY!Filed to: BOX BOY! 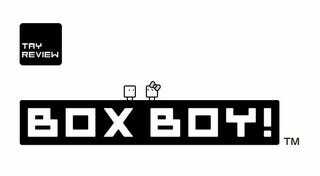 Stop whatever you’re doing right now, and go download Box Boy! at the 3DS eShop! It’ll cost less than a hearty lunch and will leave you more satisfied than a $5 sandwich from Subway. That two sentence statement up there should be my review. Just like the in-game level backgrounds there’s not a lot to talk about here. But that is not necessarily a bad thing, since the people at HAL Laboratory decided to ditch the extra pizzazz for simple yet addictive game design. Think of Box Boy! as the 2006 first person puzzle-platformer Portal, now take those portals and replace them with boxes (and also make it a sidescroller game, because limited budget on a limiting hardware). Now take away the convoluted story of a sentient computer trying to kill you and pretty much you have a game that is purely gameplay and the mechanics that surround it. In Box Boy! you controlled a little box named Qbby. He or she (depending on the costume you pick, I honestly prefer the pony-tailed version of the character) can’t do much. As you trek along the first level of the game you stumble a series of small obstacles, like a wall or a gap, the game explains with a small window that you can overcome with said obstacles with the press of a button, in this case it’s the B button (why B and not A is a decision that baffles me). You see Qbby can spawn boxes. And boxes can help you get across the levels in the game, simple as that. No super jump, no copy abilities, no floating, just boxes; and the limit of boxes you can spawn depends on each level. Just like Portal makes you think about portals, Box Boy is all about thinking about the boxes, and just like Portal, it’s simple and addictive. 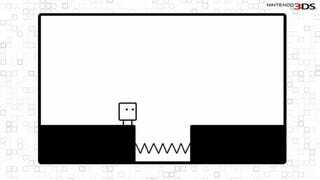 Qbby looks simple, I mean it’s just a box with legs and eyes, sure it can poop boxes and use them to reach the goal, but in design it is nothing more than a glorified 1 by 1 square. But being simple doesn’t mean Qbby has to be bland. As the game progresses Qbby can don an array of interesting costumes, Rapper to Devil, to Wizard and Bunny, and even better, some of this costumes grant Qbby with extra abilities. Some costumes like the Wizard allow him to spawn one extra box over the level limit, and others like the Bunny grant him the ability to jump twice as high! If the 150-plus levels of the main game are not challenging enough, the in the in-game shop lets you unlock two different set of challenges: Time Attack is all about tackling levels as fast as you can, think of it as a speed runner version of the main game, only with different levels. On the other hand, Score Attack focuses on collecting as many medals as you can in a limited time. Both modes will test the abilities and skills you have learned in the main adventure. At least it’s longer than the first Portal and it rivals the length of HAL’s previous game. But with no lore or complicated story, I guess some players out there may want more. And to be honest I really don’t know if the length of the game should be consequential. The game costs less than any other title developed by Nintendo, but it has the quality of every Nintendo published game. In the end it’s not about how long was the adventure, but the journey itself, and each level of Box Boy! leaves a desire for more challenges. It is simple as that. Although the music is never terrible, it also doesn’t evoke any feelings, it exist to accompany Qbby through his Journey to save the planet from the black smoke. It’s understandable, Box Boy! being a puzzle game at heart, you don’t want the music to distract you from the “action”, which means convoluted sounds should be out of the question. Rhythmic beats and swaying melodies, sometimes it’s beeping sounds, other times it’s a set of piano chords, and in every now and then a guitar chimes in. In rare cases the track becomes more complex as it tries to evoke a feeling of the characters in the game in the half minute cutscenes. You could criticize how simple the game is, but to me that’s part of the charm of the game. Yes, Box Boy! is a game that was developed on a budget, HAL could have created another character like Kirby, but to be honest I prefer the simple and charming Qbby along with its costume variations. I may be biased towards the game, since it won me with its minimalistic design, and uninspired levels, but I think of the white background as a blank canvas with endless possibilities. Box Boy! is level design 101, and every aspiring developer should take notes, this is how you create a game. Plus with the price tag set so low, you cannot go wrong. As I said in the opener, go download this game if you haven’t, you won’t regret it. Worst case scenario, I will send you $5 myself or some sort of equivalent (I can juggle, dance, cook, and entertain a small crowd). Follow Nach on Twitter @Nach212 he may tweet or may not tweet between gaming and eating sessions.